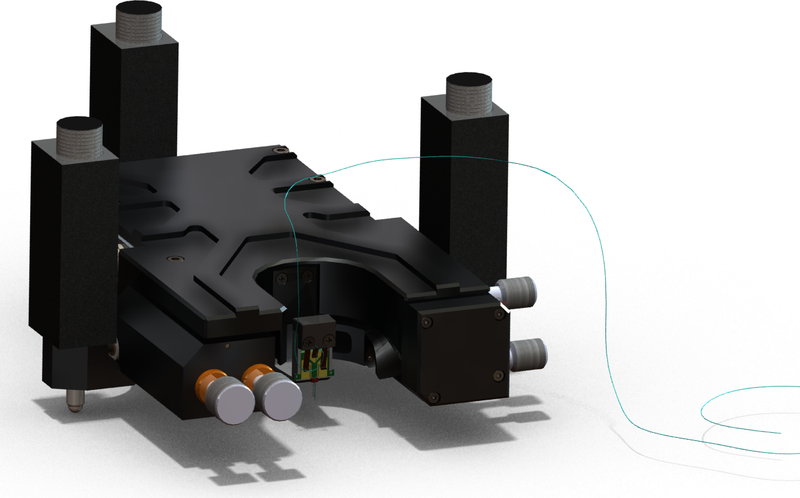 Certus NSOM - Near-Field Scanning Optical Microscope. Certus NSOM - is a Scanning Probe Microscope (SPM), equipped with special probe holder and optical equipment to conduct studies using near-field effects. Near-field optical microscopy is based on the properties of near (evanescent) field, which allows to overcom a diffraction limit of classical optical microscopy. Optical probe is the main element of any near-field optical microscope. The design of such probe allows to localize electromagnetic field in a region of space with size less than wavelength of applied radiation. There are two methods of localization of electromagnetic field: aperture and apertureless. 1) To illuminate the object and / or to detect the signal the aperture is used, whose size can be substantially smaller than the wavelength of light (d <<λ). 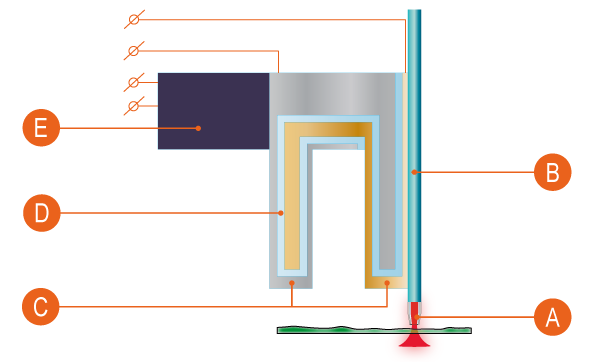 Usually the probes based on metal coated optical fibers are used with an aperture at the probe tip. In this case the aperture should be located at a distance which is smaller than the wavelength (h <<λ) above the surface. 2) To radiation localize used by probe tip, approached to the illuminated surface at a distance less than the wavelength. 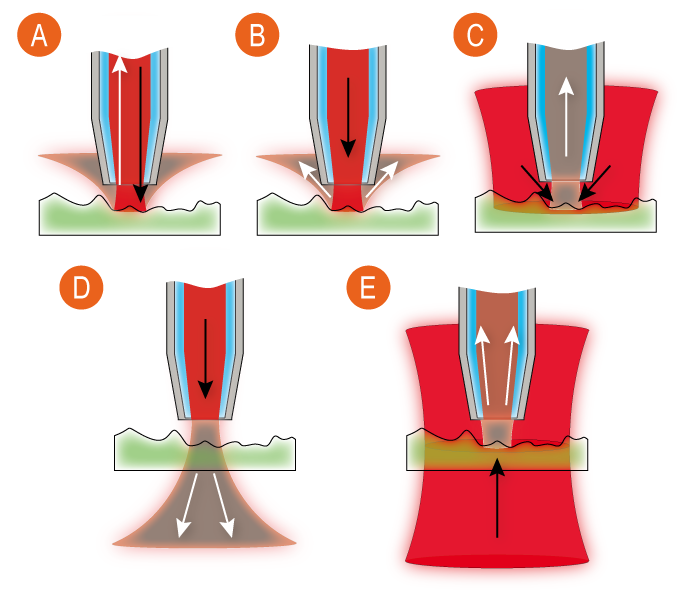 In this mode, the tip scatters (turns to far-field light) the near-field, localized near sample surface. 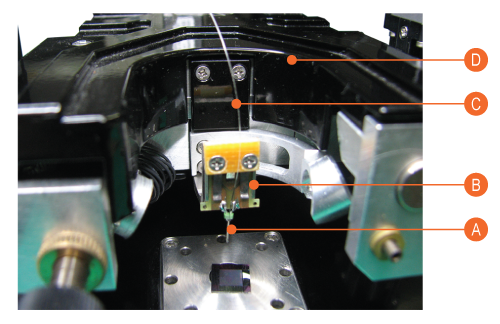 Near-field optical microscopy with aperture probe. 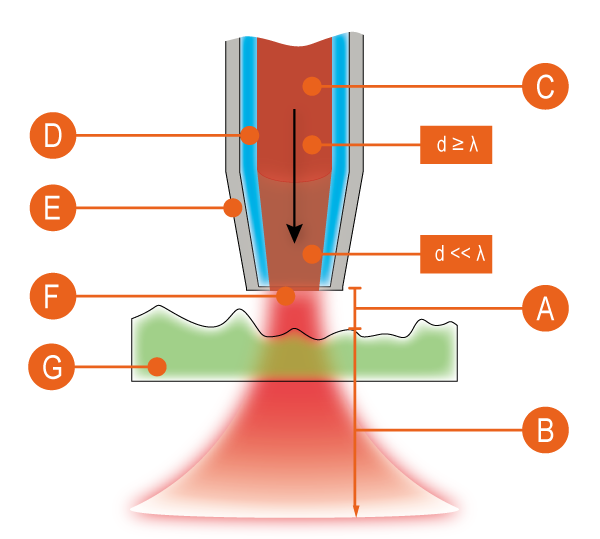 In the most common case, the probe for aperture near-field microscopy is metal coated optical fiber with truncated cone on the end and aperture on top of the cone. Aperture size and coating material varies depending on the technique and the required resolution. Typically, the aperture diameter is in the range of 50-100 nm, and coating is done with aluminum or silver. Exist for some basic techniques of lighting and / or signal detection. A - for illuminate and collect reflected radiation use the same optical fiber. B - for illuminate use optical fiber probe, collect the reflected light from the sample surface. C - for illuminate sample use an external source of laser radiation, to collect reflected radiation use probe. D - for illuminate the sample use a probe, collect transmitted light. The technique is applicable only to transparent samples. E - for illuminate sample use an external source of laser radiation, to collect transmitted light use probe. The technique is applicable only to transparent samples. Regardless of optical probe can collect the signal only at one point. To construct a raster image requires a system of moving the probe relative to surface in XY or XYZ coordinates (raster scanning system). For scanning systems use scanners, similar to scanners tunneling and atomic force microscopes. That is scanners with piezo-tube or plane-parallel scanners. At Certus NSOM scanning head Certus and XY-scanning stage Ratis allows you to use external large aperture objectives, illuminators, microscopes condensers, etc. to illuminate the work area, monitor the sample and the probe position, to take stock of radiation in the point of contact of the probe and the sample. Which allows the use of all basic techniques of near-field microscopy. To register change distance between probe and sample surface (Z) use same methods as in atomic force microscopy. The most widely used method "shear-force" and registration of probe position by deflectometer. "Shear-force" method is based on detection changes oscillation frequency of probe caused by tangential component of interaction forces between probe and surface. To determine changes in oscillation frequency use tuning fork resonators, oscillation which are detected by direct piezoelectric effect of quartz crystal. C - electrodes used to measure voltage changes occurring on sides of a quartz crystal (direct piezoelectric effect) due to changes in frequency during interaction with surface. Information about voltage change to determine current frequency of resonator. D - quartz crystal (piezoelectric). E - dither piezo used to create a forced oscillation of resonator (setting initial frequency of resonator). A - quartz tuning fork resonator with probe. D - SPM head Certus. For excitation and detection of optical signal use optical unit, composed of laser light source, polarizers and signal detectors (avalanche photodiodes, PMT or CCD). Optical unit configuration collect for task and budget research laboratories. Vanadium test grating. Images was obtained with NSOM/Snom system Certus NSOM O. Тransmitted light. Simultaneous AFM and NSOM images. Image size 8х8 μm. 256х256 points. Upper image - near-field image. Center image - AFM image, topography. 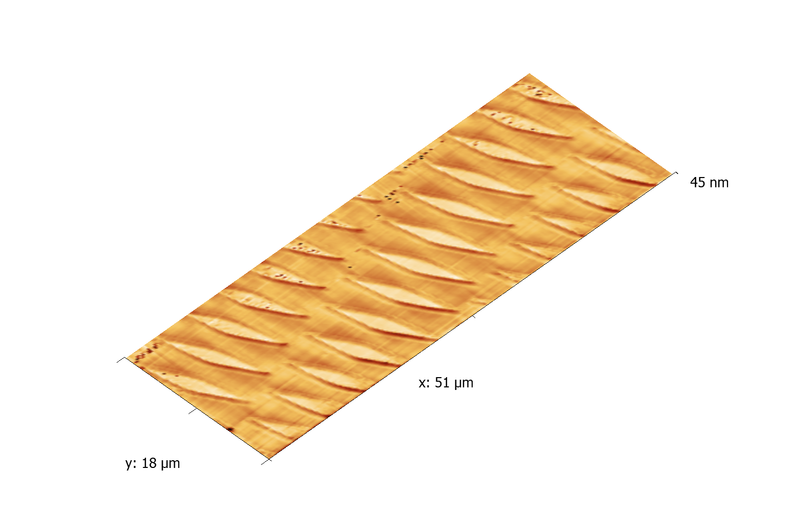 Lower image - topography 3D (AFM). Certus NSOM S - modification of scanning probe microscope Certus Standard. Microscope Certus NSOM S allows the use of near-field optical microscopy techniques based on light reflection from the surface or probes. XYZ probe scanning with head scanner. Certus NSOM O - modification of scanning probe microscope Certus Optic. Complex Certus NSOM O enables use near-field optical microscopy techniques based on both reflection of light from the surface and transmittion light through the sample. Two scanning modes: XY sample scanning with Ratis stage and Z scanning with head scanner Certus, or XYZ probe scanning with head scanner Certus. In addition, when XY sample scanning Certus NSOM O operates as the laser confocal microscope. Certus NSOM modification for AFM/Raman/Confocal system Centaur (HR). For complexes Centaur (HR) based on SPM Certus NSOM as an additional option implemented techniques of near-field optical microscopy with aperture. Apertureless techniques implemented in these complexes by default. Image size 50х15 μm. 256х77 points. Upper left image - near-field image. Upper right image - AFM image, topography. Lower right image - topography 3D (AFM).